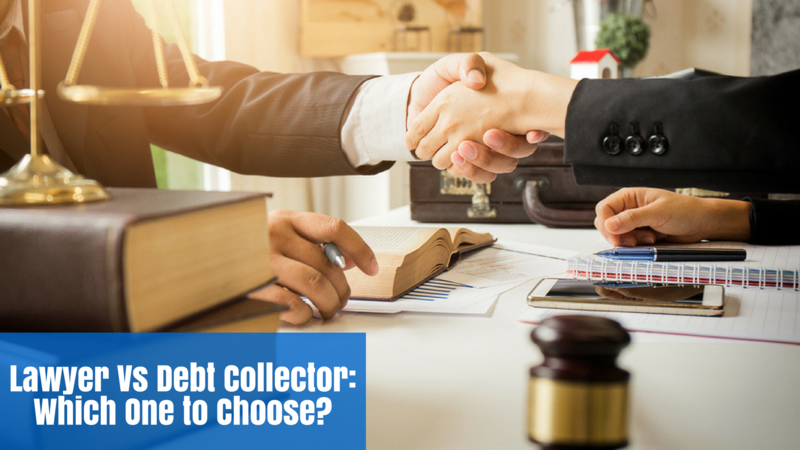 Lawyer Versus Debt Collector : Which One to Choose? A lot of my clients are not quite sure when to use commission-based debt collection or when to go straight to legal proceedings. So I thought I might try and provide a little outline for you, since we are both debt collectors and also legal practitioners who specialise in debt collection. Firstly, it’s important that whatever you do, do it quickly. The longer you wait to collect a debt, the harder it is to collect. The more time you waste on repeating the process of chasing letters, emails and calls the less chance you stand of recovering payment. If your debtor has been unable to pay you, chances are they will be also be owing money to others, who will also be trying recovery action, so it is vital that you are first cab off the rank. I strongly suggest you hand it over to a professional, once your internal efforts have failed. Make sure this is their speciality. that is, if it’s a debt collection company – make sure, either the debt collection agency or the lawyer, have experience in collecting debts for your particular industry. Ask them detailed questions and also ask them for references from current or past clients. Speed. Do you really need the money fast? If you need your money back fast, consider a no win-no fee debt collector. They have the incentive to collect fast, since they want to be paid their commission as well. The legal process can be long and drawn out so this is a major factor if you have cash flow problems. Cost. We work on a commission but some of our clients have quite large debts, so they are concerned about how much they are losing to us in commission, so we then recommend legal action. On larger debts, say over $100,000.00, we always recommend legal action, rather than debt collection. When you have debts of this size, it’s better to secure your debt. This means that your litigation agent can get a court ordered judgment against your debtor to pay the money, plus interest, back to you. This secures the debt for a specific period, depending on the legislation in each state, usually 12 years. The main advantage to going with a debt collection agency is that they shoulder the burden of sending collection letters, making calls, and negotiating payment. A lot of debt collectors do this on a no win-no fee basis, meaning they will not charge for any of these fees at all. They will only charge their commission and only if and when they have successfully collected the debt. Lawyers, you have to pay either way, unless they are also willing to take your matter on a no win-no fee basis. Outsourcing to a debt collection agency, allows you to focus on the important things like running your credit department or running your company. Lawyers can be a good option when your debtors are refusing to pay, due to contractual or product or service disputes. If your debtor is absolutely refusing to pay and you are confident you have a solid contract and you are also aware that your debtor has the means to pay, then legal action is the best option. Debt collectors can only go so far with some debtors, as most of these serial debtors are fully aware that debt collectors cannot enforce them to pay in any way, nor can we charge interest, unless the debtor has previously agreed to it. Your best option is to choose a company that does both, so you are looking for a debt collection agency with national catchment, that also has a legal arm. Companies that provide both solutions can give you an end to end service. So they may fail at the commission-based debt collection, but they may then be successful on the same case, by handing it over to their legal arm. They will be able to give you a realistic solution, depending on your needs, rather than suit their own needs, which a stand-alone law firm may tend towards. Agencies that have both debt collection and legal options within the same company, generally also offer free legal letters of demand. A letter from a solicitor is often enough to prompt a debtor to take action, especially if they are threatened with court proceedings. Consider perhaps a debt collection agency that provides free legal letters of demand as part of their service. What agency provides all these services you ask? We do of course, Debt Recoveries Australia and ADC Legal. Your one stop shop for debt collection and debt recovery litigation. What collects money is the intervention of a third party into the account receivable process. Until this happens the debtor has been able to string you along for 90 or more days. About a third of such past due debtors will pay almost immediately upon receiving notice that a third party is now involved – no matter how large the amount. Lawyers, who are paid by the hour, are notoriously slow to get off the mark. Ideally you want to work with a collection agency that provides free final demand notices that state that a specified collection agency will open a claim against the debtor in 10 days. This interjects the third party into the process and will probably collect a significant percentage of debts if it is used early in the account receivabl process (around 60 days past due). The older the debt the less effective it is. If the amount is paid within the 10 days the collection agency should not charge a commission. Only after the collector has thoroughly worked the debt should it then be forwarded to a lawyer. It is always better to negotiate a settlement with the debtor then to proceed into litigation. Litigation takes too long and is too expensive. Every debtor seems to have an excuse for not paying their debt and you can never be certain how a judge will rule, no matter how ironclad you think your case is. This is why only a very small percentage of account receivable debt ever goes to trial. By very carefully monitoring your accounts, using credit reports, going to industry credit group meetings and utilizing all the many information sources available the number of accounts going past due should be few and far between. Some great points there Ian. Thanks for your input. Agreed on working with a collection agency that provides free legal letters.